The EDIES “E.D.ies” stand for Economic Development awards, and are designed to celebrate and highlight innovation. These awards feature undertakings by businesses, nonprofits, property owners, workforce, educational institutions, and governments of Tama County who implemented innovative solutions to real world problems in 2011. The Tama County Economic Development Commission recognizes these progressive movements through its EDIE Awards. Last night we celebrated the successes of 2011 and revealed outstanding initiatives in eight fields of economic development. Wendt Tire and Service won in the business formation category: Retiring entrepreneurs are a great threat to small town vitality. With fewer options, resources, and entrepreneurs in rural communities, we encourage business owners to at least start planning their exit strategies 10 years before their goal retirement date. In the case of Kaufman Tire & Service becoming Wendt Tire and Service they modeled one of the great buyout strategies. Eugene “Butch” Wendt has been employed with the organization, so when he purchased the business in 2011 with the help of a few investors he already had an insider knowledge and business relationships in place for a healthy transition. Hometown Foods won in the expansion & retention category. For many small towns, local retail is the man-on-the-street’s measurement of economic health. So when the 2010 Iowa Grocery Industry Association Retail award winning Hometown Foods chain of locally owned grocery stores moved into Traer in 2011, it breathed new life into downtown and the surrounding businesses. This Tama County expansion is in addition to six other Hometown Foods grocery stores owned by Lyndon & Joani Johnson located in Gladbrook, Conrad, State Center, Hubbard, Baxter and Waterloo. Traer Municipal Utilities Wind Turbine won in the financing category. When it became apparent a few years ago that Tama County, Iowa has above average wind speeds and better transmission lines than many other places with wind capacity, diversifying Traer Municipal Utilities’ energy portfolio with locally produced wind energy became an even stronger consideration. The ultimate goal being proactively diversifying for reliability and hedging future energy costs. Ultimately the project was financed by the wind turbine developer with the $3 million future energy payments spread out over six years. The turbine is expected to produce 5 million kWH’s of energy on an annual basis, which will offset roughly 30% of Traer’s annual energy requirements. It is the first commercially operated wind turbine in Tama County. H & R Block won in the real estate category. The Pizza Hut building in Toledo was a white elephant. It stood empty for six years before Elaine and Mark Linser recognized a new vision for it. In 2010 H&R Block experienced a 42.8% increase in new clients so they bought the building for a fraction of its listed price and transformed the building into a series of modern offices, a comfortable reception area and a training space. In 2012 they plan on employing 12 tax professionals as well as a receptionist. Meskwaki Museum won in the marketing category. For decades the Sac and Fox Tribe of the Mississippi in Iowa (Meskwaki) have kept their culture private. You could catch glimpses at the annual Pow Wow festival or a few panels on display in the lobby at the Meskwaki Bingo Casino Hotel. But in 2011 the Meskwaki Museum formally opened at the Tribal Headquarters campus under the direction of historian Johnathan Buffalo and invited non-tribal members to learn more about the Meskwaki culture. It features artifacts, utensils, photographs, documents, art, bead work, and other items passed down from the Tribe through the years as well as objects donated from Tribal members and non-Indians. The Meskwaki museum is a part of the group of projects that earned Tama County an Iowa Great Places designation. Vining City Hall Makeover won in the community development category. The smallest community in Tama County calls itself a family. Often to follow that up with a poverty joke on how the city’s income to manage city affairs is below that of the average American household. But it is a community with heart and a sense of humor. In 2011 they had a special “heart” transplant when their “Heart of the Bohemian Alps” roadside sign needed to be replanted. And when the modest city hall needed a new roof and shelving to protect the 130 years of public records, it was Mayor Dale Stout, Council Member George Bazal, and resident Fred Vore who donated labor in conjunction with a small $1,730 grant from Tama County Community Foundation to get the job done. Meskwaki Inc. won in the workforce & education category. Diversification of income streams is the premise behind the formation of Meskwaki Inc., a for-profit corporation created to help tribal members startup businesses, corporations leverage 8a partnerships, and other profit generating enterprises to create jobs. In 2011 the founding board convened, legally separated operations from tribal government and hired a headhunter to recruit a serial entrepreneur to the area. The position is expected to be filled early 2012. 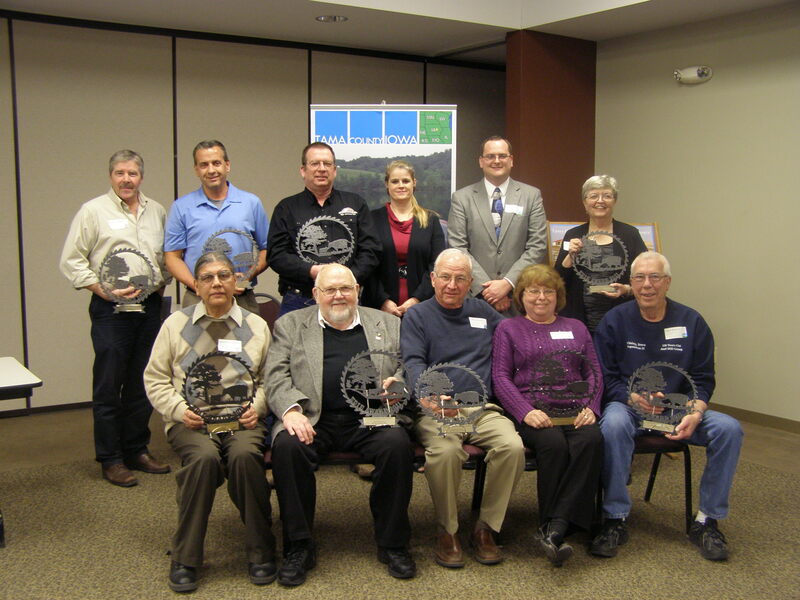 2011 Storm Recovery (Tama County, Clutier, Dysart, Garwin, Toledo) won in the strategic partnerships category. On July 11, 2011 around 4 am Tama County was hit by a straight-line wind that measured forces up to 130 miles per hour before meteorological towers disintegrated. Not a single human life was lost, but $100+ million in lost productivity was suffered through the loss of animals, buildings, infrastructure, crops, and other protective vegetation. The communities and partners that worked together to increase safety and functionality after this unprecedented once in a thousand year storm hit are being recognized for their contribution to the economy in 2011. And now the search has already started for Tama County’s 2012 innovators. Ideas are in the pipeline and projects are underway across the county. As always the Tama County Economic Development Commission will be there to support innovators. Pictured (front row) Johnathan Buffalo, Don Lyons, Carl Zoffka, Ardene Cross, Dale Stout; (back row) Mark Linser, Lyndon Johnson, Butch Wendt, Tammy Wendt, Brian Sokol, Ellen Young. Photo by Lindi Roelofse.